Product Management is a set of hard and soft skills that, when mastered, helps a lot to bridge the gaps between the triangle composed of the business, the UX, and the tech. 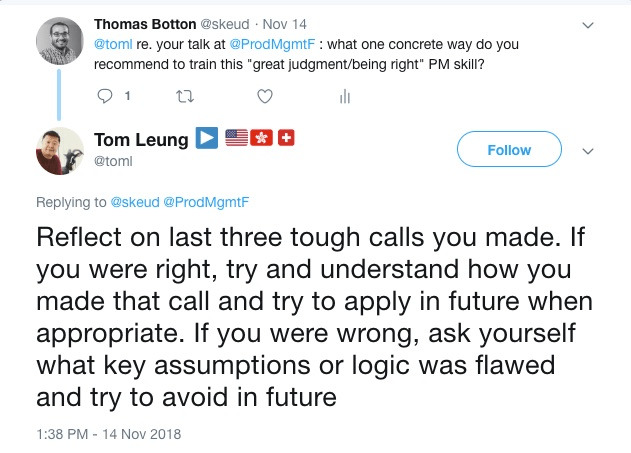 This know-how helps me a lot to build the right products for our customers and their end users, and not only to build it right by using Scrum. 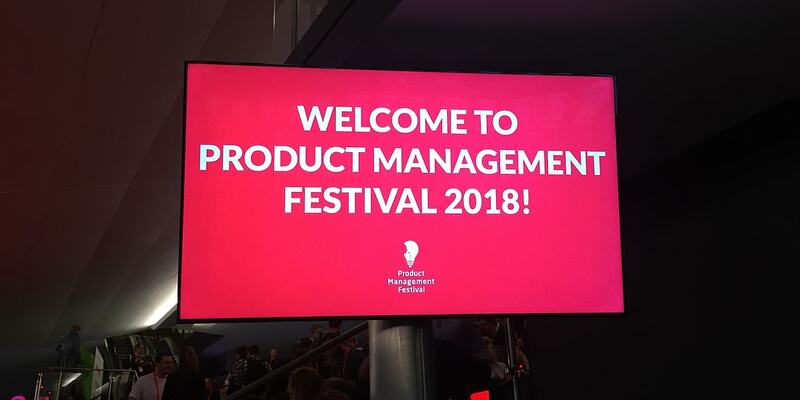 I went to the Product Management Festival 2018 edition last week in order to learn about current the best practices in the field. You find below the notes and learnings I took away. Glassdoor wishes that every company would be more transparent about salaries. But internally, they don't openly share them. We made the move to full salary transparency here at Liip. I can't help to recommend any company to do so, as it only brings more fairness. On the short term, there are painful discussions to have. But it pays off on the long term, as people with salary issues get to understand why, and are then able to improve. Hopefully Glassdoor makes this move soon too. Christian also talked about monetization. As an entrepreneur myself, that's a topic that I love to discuss as it's so challenging to find the best ways to make money in a way that is win-win for the the entrepreneur and the client/user. As the saying goes: "Revenue is like oxygen for a startup. We don't live for it, but we need it to live". I disagree with him about one point: he explained that monetizing vanity was one key way to make money from their product at Glassdoor. My (potentially hasty) conclusion from this statement is that it sounds like the most economically viable solution. I'm challenging it because, as a CEO or founder, I would focus on finding better value for money strategies. I don't think exploiting such human nature trait foster better behaviours. I prefer having less paying customers, but that get real value from it. And there is for sure good value in Glassdoor who helps employees have the same information access as companies get when they interview you. I asked Christian to know more about his opinion. You can follow the discussion here. This talk resonated a lot with me, as I feel that Liip and our self-organization model provides the best of both world: having your own startup, within the comfort of a company with 180 employees. The only thing that matters is product-market fit and repeatable growth to sustain on the long run. And not your big media coverage, nor your invitation to talk at this big conference. These latter are only vanity metrics, that should come as results and not objectives in their own. Would you use your product if you weren't in this company? If not, then you're probably building the wrong thing. Or at least it will be harder for you to stay motivated month after month. You'll need to accept and cope with some (long) discussions to convince and rally people to follow you (aka. politics). Else you're better to stay at your startup. Startup veterans are like wild horses, and it's very hard for true entrepreneurs to go to big corporation. Often, after acquisitions, you see founders leaving. Not because they don't fit. Just because they need to move on and craft their next thing. Startup move fast. Every day. And that's a drug hard to give up once you sensed it. Delivering results: "This product growth happened because it was this PM in the team"
I mostly rehearsed knowledge, but it was still interesting to see how they apply it at Typeform. One of the trick to ensure self-fueled growth of a product is to make use of viral loop. A viral loop relies on the viral coefficient. Put simply it's the number of new users that an existing user generates. A 0.3 coef means that for each 10 users, you will get 3 new users. If you get above 1.0, then you get exponential growth. Signup: creating a typeform account requires only 3 fields for lowest friction possible. Motivation: here comes their value proposition, which is sharing a Typeform form. To support this, they provide plenty of options so that you, as a customer, find a way to share your form and don't leave the platform there. Share: the nice fact is that sharing can be part of your product, like Typeform which goal is to be shared to collect responses. That surely help to develop your own viral coefficient. Impression: finally, when using the product, there are some tricks to leave your name around. Like the Intercom tool design that, even when customized is recognizable. Or Kickstarter, which you may use in 3-5 years when you suddenly get this idea of a new product to be backed up. At Typeform, their easily identifiable's user interaction and bottom logo play this role. Once this loop is completed by one user, the new acquired customers fuel the viral loop themselves. 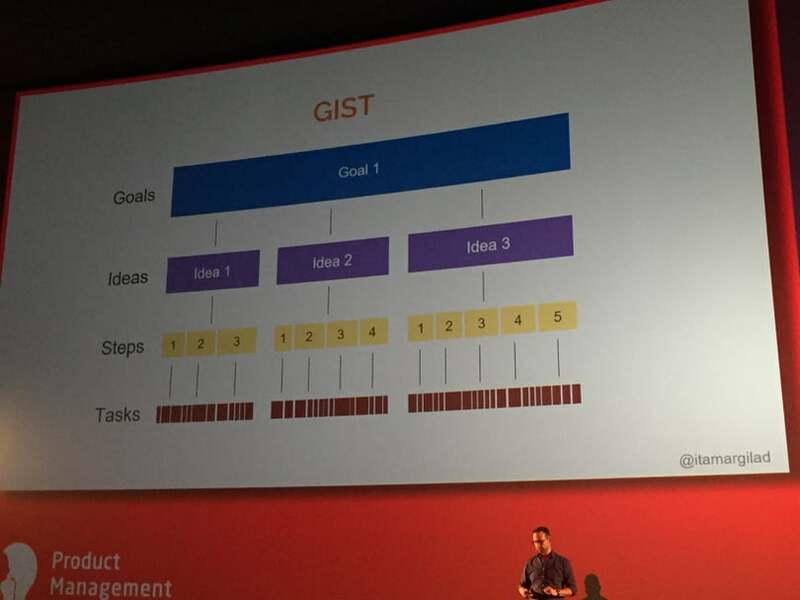 GIST stands for Goals, Ideas, Steps, and Tasks. It's a product framework imagined by Itamar while he was PM at Google. It mixes Lean Startup and Agile concept to align people from top management to delivery teams. It aim to avoid the pattern consisting of: the strategy definition, then the roadmap building, then split into project plans, then the (Agile) execution done waterfallishly. You define goals using the OKR system for the next quarter. It's easy to adapt on the go, and is easily defined between stakeholders. And it's transferable/visible to anyone in the organization. Below the "Goal" timeline, you then have to fill your tank with ideas to accomplish this objective. The more you fill the tank the better, knowing that only 1/3 of ideas are good at supporting objectives. Afterwards, you evaluate your ideas against a prioritization-by-evidence mechanism, like the ICE one (standing for Impact, Confidence, and Ease) popularized by Sean Ellis. Once you found your next idea to validate, you go into a 10 weeks block of experiments as with the Lean Startup methodology. Each experiment above can be seen as a Scrum sprint or can be detailed using Kanban. You can use whatever tool you're used to work with for this. As you can see, compared to waterfall then Agile iterations, you get the whole system to iterate as a whole. That's somehow how we operated at Liip, but a lot less formally. I will apply it on a small scale project to see how it works, and experiment with the pros and cons. For a mental model's addict as I am, it was quite of an interesting session. If you wanna learn more about GIST, I recommend you this reading. The definition of influence is to "change how people think and act". After this first sentence from Stephanie, my first reaction was "No thanks, I don't wanna become one of these manipulative people." My second reaction was: "Well, I influence my kids every day for educational purpose. I also influence my clients to show them how Lean Startup, Agile, and self-organization principles are great. So it may not be that bad to learn more about this topic." Stephanie and Kara then explained that infuence is made of two things: power (given to you, and situation agnostic), and pathway (which is situation specific, depending on which path you choose). They focused the rest of their talk on the power part, as it's situation-agnostic, so applicable to the biggest number of people in the room. Reputation: what people say when you're not here. The best way to score point is honesty. With everybody. Grit: the desire and courage to act. It's an accelerant for all points above. Everyone has it. It's a muscle. The more you train it, the more you get good at it. Make sure you know your why first, then act on it. Relentlessly. That's for another mental model of what power sources I can activate to better influence people. As with any power sources, it's better and stronger when it's balanced. 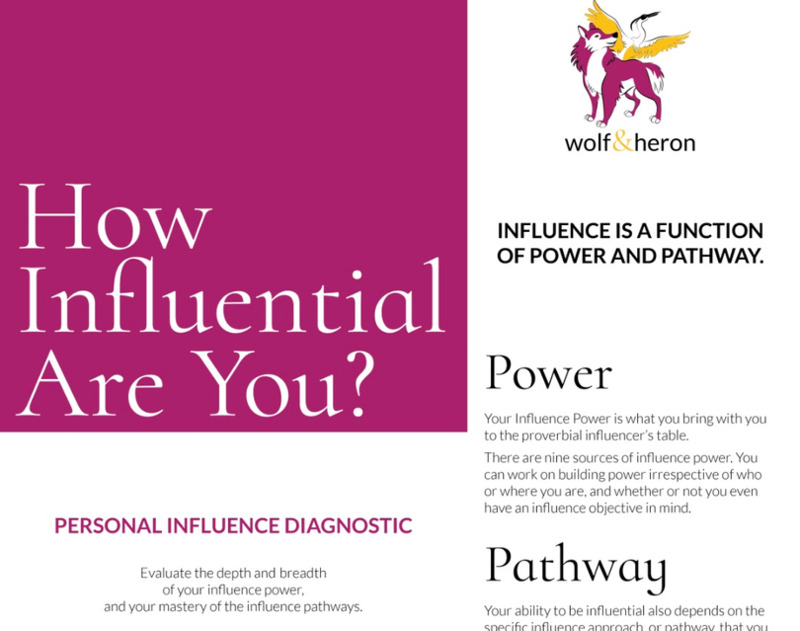 By the way, their company Wolf and Heron provides a "Personal Influence Diagnostic" on their website if you're interested to develop this part of yourself. Ah, and don't forget, if you change how people think and act for bad reasons (including selfish ones): that's manipulation. You don't wanna do that. The famous NBU as they now call it. The Next Billion Users. To be frank, I feared to only hear the message "We at Google will change every single part of the world". I was surprised by Minal's honesty when during the Q/A someone asked why big companies didn't ally to have a bigger impact. Her answer: "NBU is a market, and we're doing business there, not non-profit." Moreover, what she shared was down-to-earth and aligned with my beliefs. Before listing my takeaways, I will put below my notes about this big market that is India which is important to know for global corporates as this market rises strongly. People in India are way more social than we are. So much that they share their own phones. Data usage becomes more and more cheap, connecting a lot more people to the Internet. Feature phones (think Nokia 3310 but with a decent web browser) are kings due to their price. That's one of the reason behind the launch of Android Go. Thus you need to think interfaces and interactions differently if you target this market. 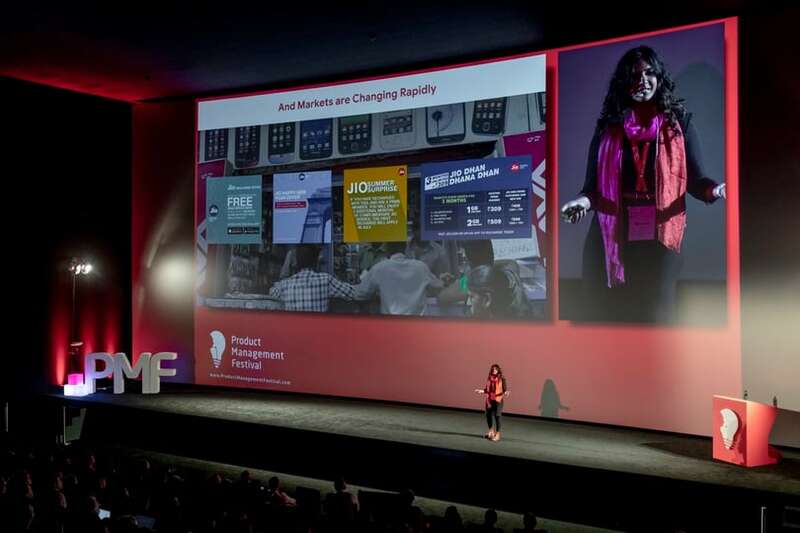 As Mina confirmed with her research on the ground, Indian people are consuming content for the same matters as the rest of the world: messaging, getting info, and entertainment. And they expect to be treated as well regarding UX as Western mobile users. Again, if you build a local product for Swiss people, that may not be interesting. On the other hand, if your digital product is useful worldwide, then you better start to plan your future holidays where one additional billion users will get access more and more to your tools. Nothing breaking new, but worth the reminder. What resonated the most with me in this talk are the five lessons that Mina learnt on how to build great teams, and stay connected with them. This to overcome the project problems the best way possible. Lesson #2: rally your team around the user and the specific needs you're solving. This specific point is critical to me, and it proved to be a game changer everytime I applied it, by asking our client to give us a tour of his company and activities, physically, before starting the project and with the entire Liip team. Lesson #3: create a culture of psychological safety. Leave room for failure, without stress, and most importantly for being one-self. 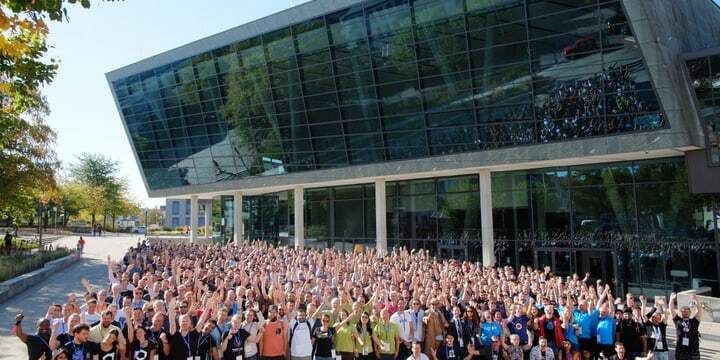 I could write hours about the impact of such culture as it makes us thrive both socially and economically at Liip. Lesson #4: leave the building to connect with your team. We like to do project retrospectives at a coffee (which happens to be a bar too:)) near our Lausanne office. 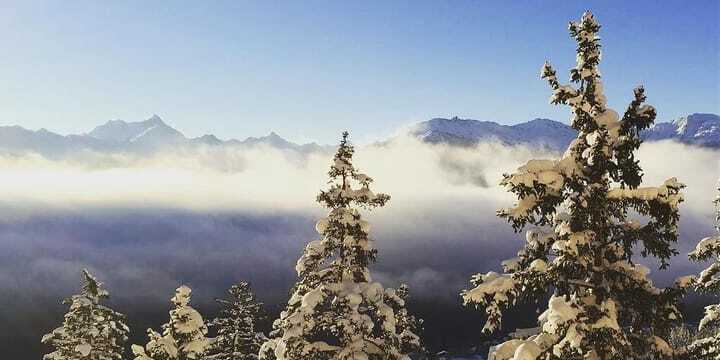 The place and its atmosphere impacts a lot the outcomes, positively. I recommend you to try it out. Lesson #5: always celebrate your wins. Always. One simple way of how I organize it is by putting myself a calendar reminder 1 month before the planned launch to schedule a "Celebration lunch". That helps everyone to see the golive positively, not stressful. Obviously, you need to celebrate smaller wins along the way too.